Reliance Jio offers high-speed mobile internet connection at low-cost data plans, which has made it the fastest growing 4G network in India. When Jio was launched, it offered unlimited voice calls, SMS, and 4G internet data for free. After that, Jio comes up with subscription plans which need you to recharge your Jio mobile number to continue using these services. Now Jio doesn't offer unlimited 4G internet data in any of its data plans. You get limited 4G data for daily usage as per the data plan you have subscribed to. If you have exhausted the daily 4G data usage limit, your internet speed will be reduced to 128 kbps. It's better to track your data usage so you don't experience any interruption in Jio 4G internet service. 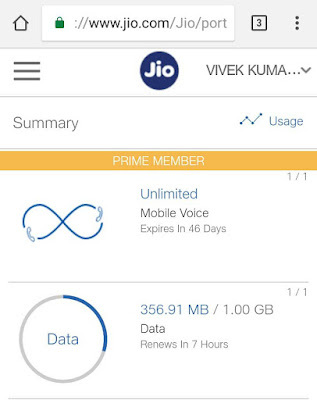 This tutorial will guide you how to check your Jio 4G data balance. We will also discuss how you can monitor data usage on your phone. MyJio app gives you access to so many Jio applications and services. You can also check your data balance & validity, usage of voice & data consumption, and new Jio offers. If you haven't installed MyJio app on your phone, then first install it from Google Play Store or App Store. To check your Jio 4G data balance, simply open MyJio app and sign in to your Jio account. Now you can view your remaining daily data balance under My Account section. If want to check complete data usage report, tap "check usage" button. Here you can check how much data you have wasted time to time. First, open the default Messaging app on your phone and SMS BAL to 199. Now you will get an automated instant reply from Reliance Jio where you can check your remaining daily data balance. If you want to check the validity of your current data plan, text a message as MyPlan to 199. Jio will also send you few messages automatically when you have used a certain amount (say 50%) of your daily high-speed internet. 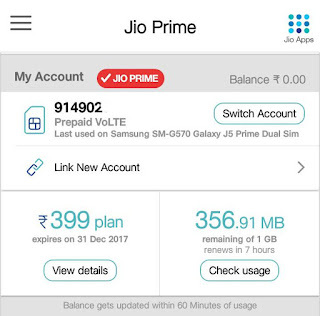 You can also check your Jio 4G data balance online without using any third-party application. Simply go to the Jio's official website and sign-in to your Jio account. If you don't know your email address and password, you can sign in with OTP. 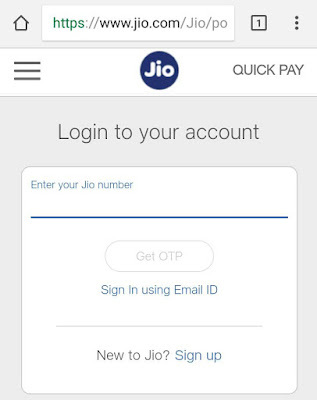 All you have to do is, enter your Jio number and then request an OTP (one-time password) to log in. Once you have logged into your Jio account, you can check your remaining daily data under Summary section. Click "Usage" option to get more information about your data usage. Some of the USSD codes aren't working now, but they are working when Reliance Jio was launched. Let us know in the comments if any of them isn't working for you. 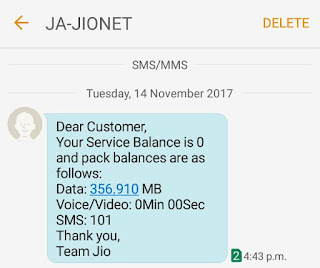 SMS BAL to 199 - Check Jio 4G data balance. 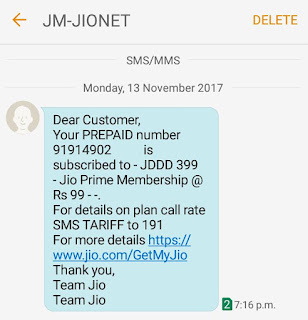 SMS MyPlan to 199 - Check your Jio number and data plan validity. SMS Jio <IMEI> to 199 - Check your Jio number used on your JioFi device. As already mentioned, your Jio internet speed will be reduced to 128 kbps if you have exhausted your daily data usage limit. You can use MyJio app to monitor your data usage, but there are more advanced apps available on Google Play Store for free. 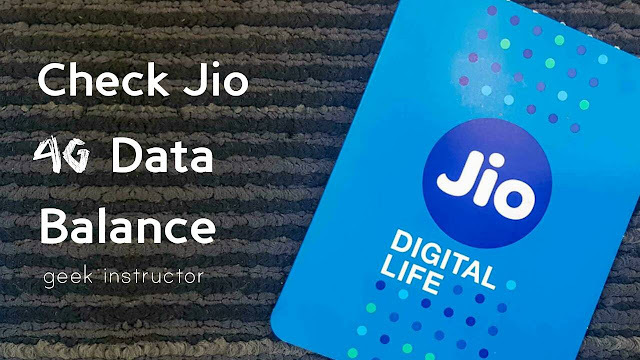 We hope you've found this guide helpful to check your Jio 4G data balance. Now make sure you read these useful tips to reduce your Jio data usage on your phone. If you want to ask something about this tutorial, feel free to share it in the comment section.